The powerful professional engines, the infinitely variable self-locking height adjustment and the large easy-roll wheels on double ball bearings will not escape your expert eye. The ELIET Permanently Sharp Blades™ are located underneath the frame and guarantee that your ELIET machine will continue to achieve the same efficiency. That is efficiency for you ! Whoever chooses the professional version of the E501 knows exactly what he wants. However, because you, as a professional user, have more stringent requirements, ELIET have also developed two other types of blades in addition to the standard fitted blades. In certain operating conditions, these other types of blades can enhance performance and promote high quality work. The choice is up to you ! The working depth is typically 2 mm. 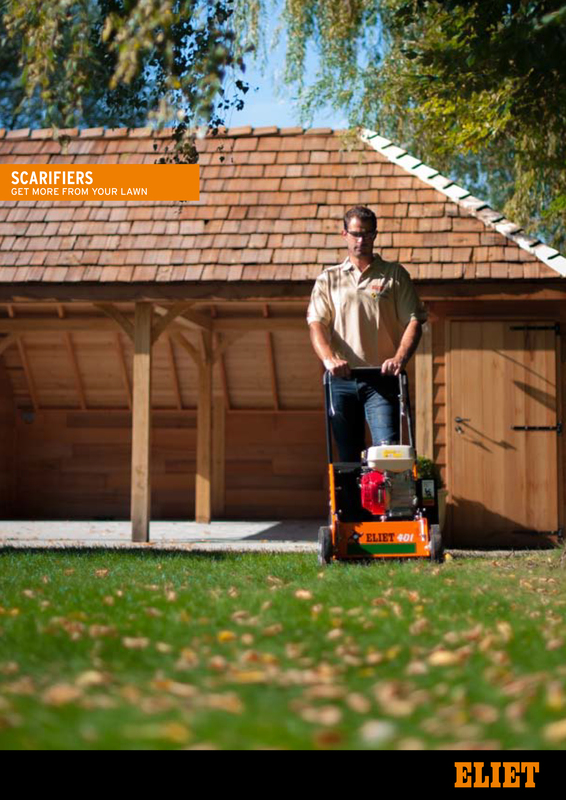 At this speed, virtually no braking is applied to the blades so that they can operate at full speed and lift up moss and thatch from the lawn surface. As the blades do not cut through the roots, this greatly reduces the time required by the lawn to recover after dethatching. Accurate and correct depth setting implies a very fine adjustable depth adjustment. To this end, the front wheels of the E 501 Pro feature an infinitely variable adjustment. This enables the same depth to be set across the entire blade shaft. The ELIET E501 Pro is equipped with a set of Permanently Sharp Blades™. These blades have a working life in excess of 100 hours. Regardless of whether you choose, fixed, oscillating or double cut blades, you still wish to completely use up the blades. Since the adjustment facilities on the front wheels are inadequate, ELIET have also provided depth adjustment at the rear. Work comfort means that you perform the work with a minimum of effort. In this respect, ELIET pamper the operator of the E501 PRO. Large wheels with light aluminium rims running on tyres with a supple natural rubber tread ensure that this machine glides across the lawn. Each wheel is equipped with two large-size ball bearings. These heavy duty wheels are able to withstand the dusty conditions in which these machines have to operate. The wide wheel tread minimizes the risk of wheel rut formation on wet lawns. Although gardeners usually wear professional working clothing and protective footwear, ELIET do not take any risks when safety is involved. The wide rubber safety guard at the rear of the machine retains all dust, sand and any stones that are thrown up out of the ground by the blades. The deflector is suspended on a chain and passively obeys each steering command. Moreover, you can suspend the deflector at the correct height, according to the thickness of the moss layer that appears from underneath the dethatching machine. Gardeners are kept busy with dethatching work in the spring when the grass comes out of its winter hibernation. Attention has therefore been paid to all components that cause fatigue. The floating handlebar is one example of how optimal work comfort is ensured. This handlebar accurately follows any ground unevenness in order to neutralise arm pressure.